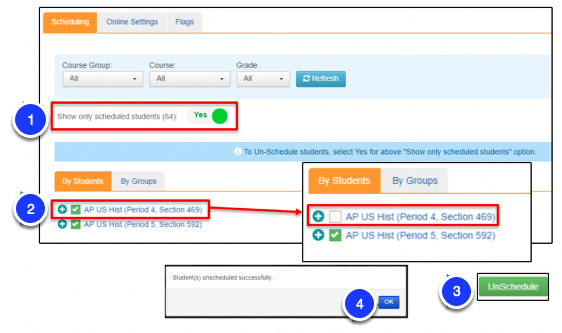 Once an assessment has been published, the roster of students that was originally scheduled to take the assessment can be revised or refined by using Advanced Settings. 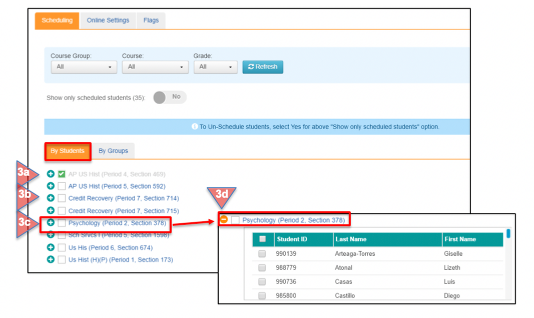 Advanced Settings for Scheduling can be accessed in two ways: 1) from the Functions drop down menu in the Assessment Manager and, 2) during the Setup step, when creating an online assessment. From the Top Menu Bar, select Assessments (1a). Find the desired published assessment from the list in the Assessment Manager. To the far right in the same row as the assessment name, click on the down arrow in Functions (1b), and select Advanced Settings. During the final Setup step when creating an assessment, the specifics for administering the assessment will be determined. 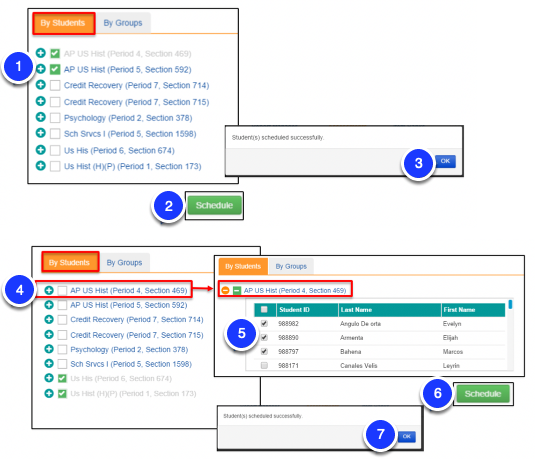 When you select Publish (2a), a message will appear giving you the option of going to Advanced Settings (2b), where these settings and others can be revised and refined. For a Teacher level user, all courses assigned to the teacher will be listed. For a School level users all teachers will be listed. For District level users, all schools will be listed. All of the students on the roster have been scheduled for the assessment when there is green box with a white check mark and the course name is grayed out. None of the students have been scheduled if there is an open box next to the course name and the course name is in blue font. Open the roster of students by clicking on the green circle with a plus sign. Close the roster by clicking on the orange circle with a minus sign. To add an additional roster of students to take the assessment, check the open box next to the course name to select it. Click on Schedule at the bottom right of the screen. 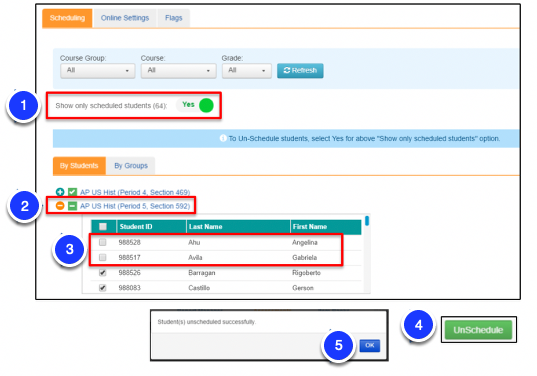 To add individual students instead of an entire roster, click on the green circle to open the roster of students. Select the students you wish to add by checking the box next to their ID and name. Slide No to Yes to “Show only scheduled students”, as noted in the blue bar. To Unschedule the entire roster, uncheck the green box next to the roster name. Click UnSchedule on the bottom right of the screen. Click on the green circle next to the roster of students to view all students. In the roster of students, uncheck those students you wish to UnSchedule. Select Unschedule on the bottom right of the screen. 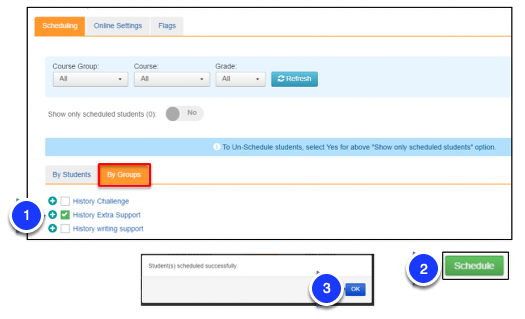 Once you have made scheduling changes, slide the Yes to No to review the list of completely scheduled, partially scheduled, and unscheduled rosters of students. A complete roster of scheduled students will have a green box and white checkmark and grayed out roster name. A partially scheduled roster will have a green box with a white dash and a bolded roster name. A roster with no students scheduled will have an empty box and a bolded roster name. Ready for more? Visit Bulk Activation for Online Testing to get started.